The TaylorMade JetSpeed driver has all the bang of the top drivers without all of the buck. The JetSpeed driver is the time TaylorMade implemented their Speed Pocket into a wood. The Speed Pocket creates a larger sweet spot and reduced spin, which both lead to more forgiveness and distance. The center of gravity (CG) has been moved lower and closer to the clubface in the JetSpeed driver, promoting a slightly lower launch angle with lower spin. Because of this feature, you’ll require more loft to get the most of the driver. The good news is that the TaylorMade JetSpeed driver comes equipped with the Loft Sleeve, which is an adjustable hosel that allows for .5 degree loft adjustments to 1.5 degrees from the standard loft either higher or lower. The stock shaft in the TaylorMade JetSpeed driver is the Matix Velox T 49, which has higher launch properties that works well with the lower spinning clubhead to create a monster driving machine. The TaylorMade AeroBurner driver has been designed with a lot of similar features found on the JetSpeed driver. However, there have been significant upgrades. The first upgrade to the TaylorMade AeroBurner driver is the Speed Pocket. The upgraded Speed Pocket has been designed to feature a deeper and longer channel promoting more forgiveness and lower spin. The clubhead has also been designed with aerodynamics in mind. Another different feature found on the TaylorMade AeroBurner driver is a rounded toe, a raised center portion of the crown, and a newly added hosel fin. These features will all promote less drag on the downswing. A quick physics lesson: if less drag is created, then faster swing speeds are generated. Therefore, faster swing speeds equal more ball speed. And both of those equate to more And all of these course distance. Unlike the JetSpeed driver, the AeroBurner driver is a non-adjustable clubhead. This driver is ready to fire as soon as you put it in the bag, no adjusting necessary. To help dial in the loft, TaylorMade offers 4 different loft options: 9.5, 10.5, 12 and 15 and each come stocked with the Matrix RUL-Z 50 shaft. You also have the option of clubhead colors, matte white or black. 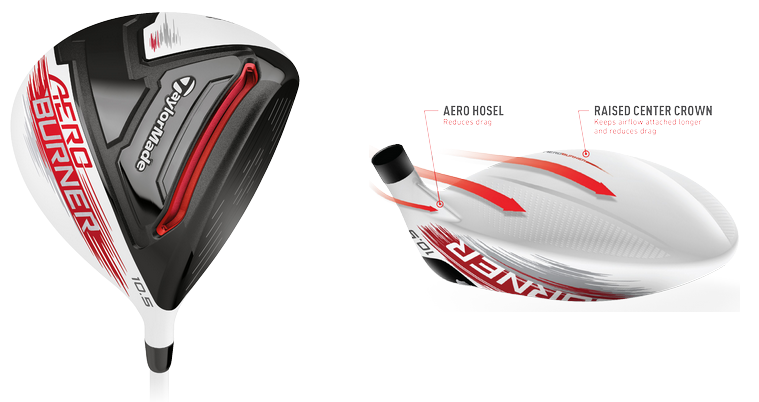 The TaylorMade JetSpeed driver is for you if…. You’re looking for a driver that gives you advanced forgiveness and adjustable features to dial in the distance for your swing. The Taylormade AeroBurner driver is for you if…. You’re looking for a driver that pushes the limits for speed (Speed = Distance). Now go ahead and reach out to us. Our PGA Professionals are here to give you trusted and expert advice. Ryan Spaziani has been a Class “A” member of the PGA of America since 2012. He graduated from the Professional Golfers Career College in Orlando, FL with an Associate Degree in Professional Golf Management. He has worked for both private and public golf courses in the Raleigh, North Carolina. Ryan has a strong passion and extensive knowledge for teaching, club fitting and growing the game of golf. TaylorMade JetSpeed Is All About Speed! Clubhead Speed, Swing Speed and Ball Speed. ‹ What’s the Srixon Z 355?